We slice them on pizza, toss them in salad and sauté them in stirfry. But have you ever thought about using mushrooms as furniture? According to the work of a team of researchers, the humble fungus is ready to leave the kitchen and take up a role as a building material. In an innovative design project, six new stylish benches have been installed outside the UBC Bookstore. Assembled from light-coloured honeycomb-shaped bricks under a top of clear acrylic, the seats are more than an eye-catching spot where students can relax—they're also very much alive, grown from a blend of oyster mushroom spores and alder sawdust packed into moulds. The roots of the project stretch back to 2014, when assistant professor at UBC School of Architecture and Landscape Architecture Joe Dahmen and his partner in work and life, Amber Frid-Jimenez, Canada Research Chair in Design and Technology at Emily Carr University of Art and Design, were expecting their second child. They had been working on an architectural installation fabricated of recycled polystyrene blocks—not exactly the most benign material —when they decided to explore more eco-friendly options. "Amber couldn't get near the thing because it was so toxic," Dahmen recalled, touring the greenhouse where the benches were grown. "It got me thinking that there must be a more natural material that would still enable a similar range of expression." In their search for an alternative, Dahmen and Frid-Jimenez discovered the world of mycelium biocomposites, an emerging field in which mushroom roots, or mycelium, grow in loose cellulosic material such as sawdust. The results are durable materials with attributes similar to that of polystyrene foams. Although a U.S. company recently signed a contract to provide Ikea with mycelium-based packaging, the method had yet to be done in Canada. Through UBC's social ecological economic development studies (SEEDS) sustainability program, Dahmen and Frid-Jimenez worked with university students and staff to develop a scalable method of producing mycelium biocomposites using two local materials: oyster mushroom spores and alder sawdust. To address the size limitation of the material—mycelium biocomposites risk contamination by mould and bacteria if they exceed a half-metre in thickness—Dahmen developed a new process that drew inspiration from a wasps' nest discovered in the empty greenhouse that would house the project. "I was really amazed at the honeycomb structure, because it's a highly efficient way of occupying space," he said, holding a piece of wasps' nest to display its dense grid of hexagonal chambers. "It's scalable, it can go in any direction, and it's extremely spatially efficient." 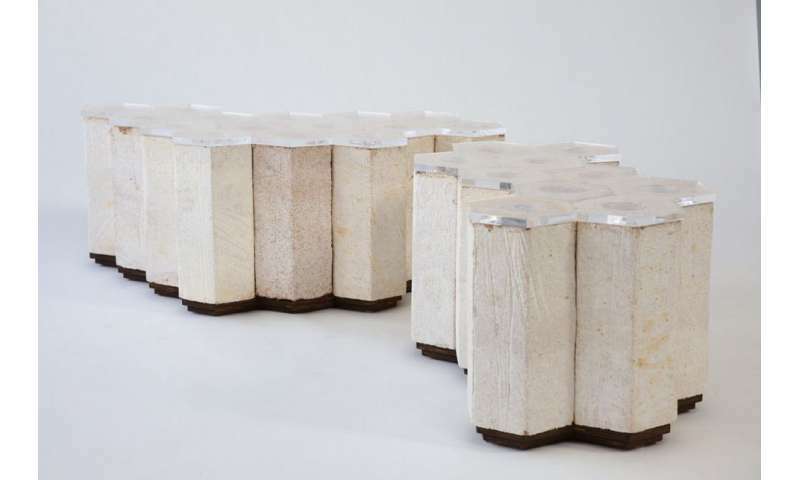 Putting a hole in the centre of each block of mycelium biocomposite not only allowed Dahmen to grow larger objects, it also provides a place in the benches for the mushroom to fruit. "That way, it's contained, so people can see it but they won't worry about getting it on their clothes when they sit down," he notes. The fact that oyster mushroom fruit are "delicious", said Dahmen, was a consolation whenever the growing process went awry. Perhaps the greatest potential of mycelium biocomposites is as an alternative insulation material for buildings. "Their biggest application in the long run is in architecture and construction," said Dahmen. "The average age of commercial buildings in North America is under 40 years. If we could imagine construction materials that add positive value to ecosystems as they break down, we have a whole new paradigm for the way we approach buildings, at a time when we're demolishing most buildings long before they wear out." Dahmen also foresees mycelium biocomposites as a replacement for many other roles played by polystyrene, from packaging to building insulation. "Styrofoam is a material that functions for a short amount of time as packaging, and then spends hundreds, if not thousands, of years in a landfill," he observed. Not only does mycelium biocomposite require much less energy to create, it also completely decomposes when composted, and helps break down other materials in the waste stream, making them available to other organisms. Alder sawdust was sterilized, blended with nutrients, and inoculated with the spores of Pleurotus ostreatus (oyster mushroom) at a local mushroom farm. The sawdust and mycelium mix was shredded in a wood chipper, and then packed into moulds. After five days, the moulds were removed and the blocks of mycelium biocomposite were wrapped in Saran wrap to encourage the growth of chitin (a strong polysaccharide similar to lobster shells) on their exterior. After drying, the blocks were ready to be assembled into benches, and covered with clear acrylic. Amber & Dahmen must have confused polystyrene with some other toxic substance since according to Environment Canada, Health Canada and the U.S. Department of Human Health Services, there is nothing toxic about polystyrene. Hundreds of chemicals are evaluated for toxicity, environmental impacts, etc. but that doesn't mean they are harmful. It is important - especially for a scientific organization - to publish fact-based information and not proliferate urban myths. If any of the people involved in this article are interested in learning more about polystyrene, they should read the research papers on this subject and not rely on unfounded statements that perpetuate this society's strange obsession with false allegations against polystyrene. To think that a bench made from polystyrene is harmful or toxic is quite astounding.